I was fortunate enough to make it to Phase 2, which is to customize a blank fitted 59Fifty New Era cap. I had about a little over a week to get it completed, along with a paragraph describing my design and creative process. I also submitted a recording of my journey of my custom cap’s creation that will be posted later on. About my cap: My design inspiration comes from the concept of finding unity, balance, and harmony with various aspects of life. Balance is derived from being whole and complete, to fulfill and live in a sense of harmony. The key to success is to unify all the different parts of your life while progressing and innovating. I wanted to incorporate diverse styles, colors, pieces of artwork (aspects of life) into a whole unit to form a new, balanced, beautiful piece of art. I wanted to inspire people to always innovate, never stagnate – don’t be afraid to do new things or take risks, and always be yourself. 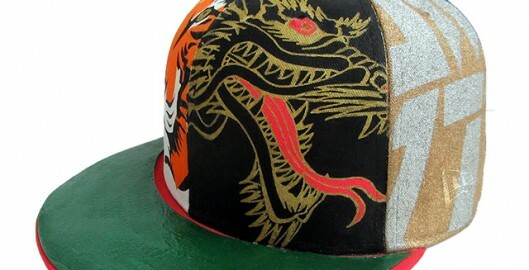 Each of the artwork panels on the cap represents inspirations and motivations to guide you through life. Dragon: supreme spiritual power, strength and good luck. Have power to live life to the fullest, be strong to conquer all and have good luck by your side. Tiger: emblem of ferocity, courage and power. Provides protection, wards off harm and assures safety. Have strength and be powerful to combat life’s challenges. Phoenix: symbol of high virtue and grace, strength and resilience. Rises above its own ashes to soar to greater heights. Koi: represents good fortune, courage and perseverance in the face of adversity. Defeat all obstacles in life to obtain the highest goals. Circuitry: represents a dependency and attachment to making lives easier (technology), while letting all other things in life pass by. Get out, get going and experience other aspects of life! Logo: keep it real, be true to yourself and never be afraid to show who you are and what you can do! Do not pretend to be or do something for gaining acceptance! Jade (cap top and brim): a symbol that brings success, love, protection, and healing properties.